In His infinite compassion and love for the devotees of North Kanara District in Karnataka, Bhagawan Sri SathyaSai Baba blessed them with the Divine Visit to their places on 23rd and 24th October, 1968. To commemorate that Divine Event, it was decided by the Sri Sathya Sai Organisation in North Kanara to organize a two day Golden Jubilee Programme at Sirsi on 23rd and Karwar on 24th October 2018. The two day programme titled, “Amarapuriya Ananda Yatra”, commenced at Mundgod from where Bhagawan had begun his Ananda Yatra. Swami’s Padukas were taken out from the Sri Sathya Sai Seva Kshetra, Mundgod and carried by Sri. Vasuki, Convenor, Sri SathyaSai Trust (Karnataka) and Sri.Nagesh Dhakappa, State President along with Nagar Sankirtan to Pattane Panchayat Garden. It was here that standing on a raised platform, Swami delivered His first address. (It is proposed to construct a Sarva Dharma Stupa there). The Padukas were kept on the same spot and Veda Chanting, Bhajans, MangalaArti were offered. Afterwards, the Padukas were placed on an exquisitely designed Rath and accompanied by hundreds of youth on motor bikes and hundreds of mahila youth on foot, it went through Malgi, Isloor to reach Sirsi town by 11.00 am. The Padukas were given a rousing reception at Sri Vidhyadhiraj Kalyan Mantapa, the venue of the Public function. Sri.Ananth Kumar Hegde, Deputy Union Minister for Skill Development, Sri.Vishwanatha Hegde Kageri, former Minister and M.L.A. Sirsi, Sri. Kumar Bangarappa, former Minister and Sorab M.L.A, Sri.Sai Giridhar, Registrar, SSSIHL, were the special guests at the function. Sri.Nagesh Dhakappa delivered the Presidential address and Sri. Aravind Balasubramaniam, from Radio Sai, enthralled the audience with his recollections of Bhagawan’s Magnificence. Sri.Sai Giridhar inspired the audience with his address. Sri.Kageri said while announcing the “Cleaning of 36 ponds in selected Villages of North Kanara District”, that it was a pious programme, a homage to the panchabhootas whom we worship, and hoped that it would further improve the water resources and ecology of the District. Sri. Kumar Bangarappa, M.L.A, released the project “Renovating and improving the village community center at Isloor” and lauded the Organisation for taking up the all round improvement of the villages. After the public function, the Padukas were taken by Rath to Mirzan Gram Seva Kendra for a brief halt and then to Hathikere for a visit to Late Sri.Vishwanath Shetiya’s place, the great devotee, who had done lot of works in Prasanthi Nilayam like carved doors for the Gopuram and Mandir and many other wood works, was instrumental in inviting Bhagawan to North Kanara. Smt. Rupali Nayak, M.L.A Karwar, participated and shared her experiences with the devotees. Smt. Priya Pai, State Service Coordinator (Mahilas) recalled Bhagawan’s visit to their house fifty years back. Sri.M.P. Pai, District President South Kanara and Sri. Nagesh Dhakappa, State President, also shared reminiscences of that visit. After Mangala Arati, Maha Prasadam was served to all the devotees who had gathered. In the afternoon, the Padukas went around Karwar town and reached Maladevi Grounds. From there the Bike rally commenced supported by finely decorated and beautifully created tableaus of Balvikas children. Over 1500 lined up in the procession, which took over two hours to reach the venue for the evening public function, Rabindranath Tagore Beach, Karwar, where Bhagawan had delivered His Divine Discourse fifty years earlier. Over 5000 devotees gathered at the tastefully decorated Tagore Beach venue to welcome Swami’s Padukas in the Golden Rath. Sri.Nimish Pandya, All India President and Sri.Nagesh Dhakappa, State President, received the Padukas and carried it to the dais. Sri.Ramesh Kumar, Hon’ble Speaker, Govt. of Karnataka, Smt.Rupali Nayak M.L.A, Sri.R.J.Rathnakar, Trustee, Sri Sathya Sai Central Trust were the special guests on the stage. After the traditional lighting of lamp, Sri.Ramdas Achari, District President welcomed the gathering. Sri. Ramesh Kumar, Speaker of Legislative Assembly and a sincere devotee of Bhagawan, highlighted the various projects undertaken by Bhagawan for the welfare of humanity. He launched the Sri Sathya Sai Mobile Hospital Project on this momentous occasion. This will provide great solace to the suffering poor and needy in the remote, tribal villages of North Kanara District. Smt. Rupali Nayak narrated how Swami always stood by her and helped her in her political life. Sri. Nimish Pandya highlighted and lauded the participation of youth, both gents and ladies, in such large numbers in organising the entire Golden Jubilee of the Lord’s Visit to North Kanara. Looking to the future, he felt that with such a dedicated Youth Force, North Kanara will celebrate the Centenary of Bhagawan’s visit fifty years hence in a much grander scale. Sri.Rathnakar mentioned that though it was a public beach, the atmosphere was similar to that of Sai Kulwant Hall and it was the Love of Bhagawan for His devotees that was permeating the entire town. He said that the sincere devotion of the people of North Kanara had brought Bhagawan and even now the place is permeated with the sweetness of Divine Love. He also recalled his visit to some remote village in Nepal and narrated the incident where he could experience the Divine Presence of Bhagawan and the unbound love and devotion the simple rural folk have for Bhagawan. Sri. Nagesh Dhakappa delivered the Presidential address in which he narrated how the dedicated devotees of Bhagawan like Late Sri. V.N.Acharya who started the Sri Sathya Sai Seva Organisation in North Kanara and worked tirelessly for spreading Bhagawan’s message, Late Sri.Vishwanath Shetiya, whom Bhagawan had entrusted with various tasks at Prasanth iNilayam and Sri.M.K.Venkatesan, Deputy Commissioner, Karwar at that time . They planned and organized the entire visit of Bhagawan and carried it out meticulously. Bhagawan blessed by staying at the Deputy Commissioner’s bungalow. Sri.Venkatesan went on to become Addl Chief Secretary, Govt. of Karnataka and was Member of Sri Sathya Sai Trust, Karnataka. 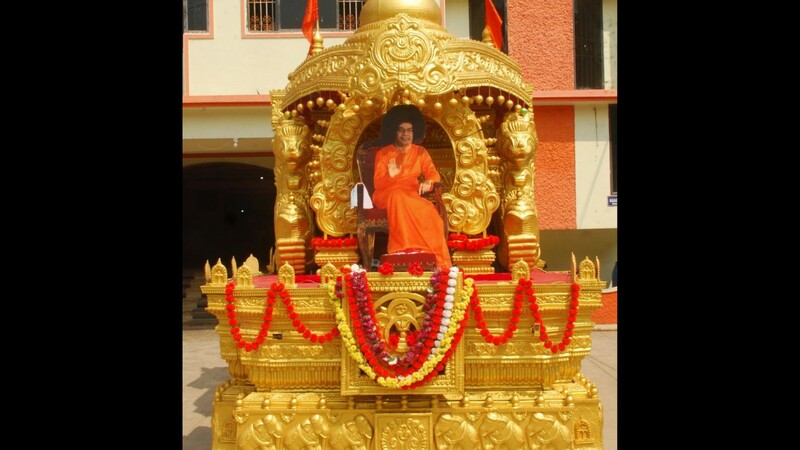 The youth who designed and created the Golden Rath of Bhagawan and his team, parents of an Balvikas Alumni who had died in the service of the Nation, were honoured on this occasion. Some of the Past District Presidents were also honoured. Sri. Raviraj Nasrey filled the air with his melodious rendering of Sai Bhajans, many of them composed by him. The large audience listened in rapt attention and so did the waves of the sea, it seemed.